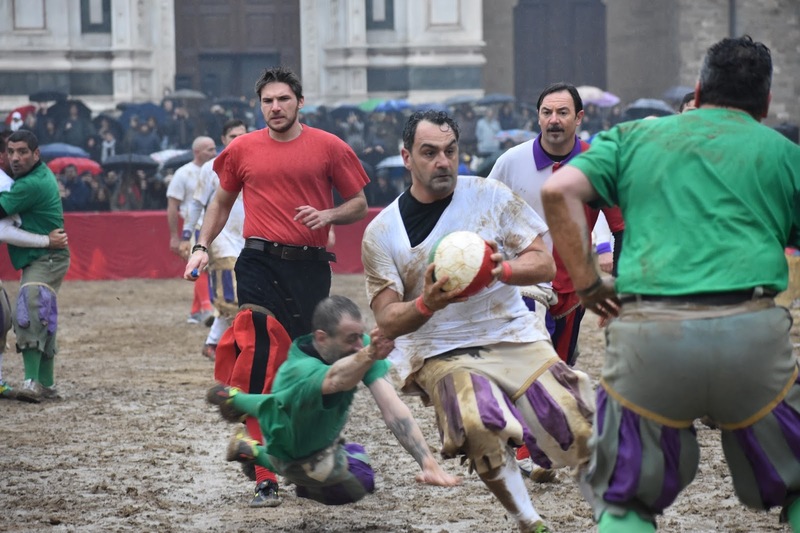 Calcio storico in Florence’s Piazza Santa Croce! Before I came to Florence, I made a presentation on the local culture for my GO class. 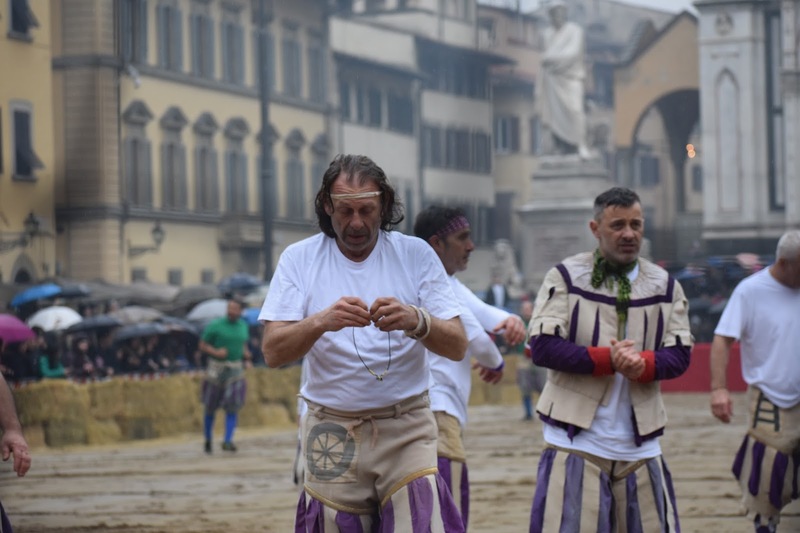 Part of the project highlighted calcio storico, Florence’s five hundred year old sport. Unfortunately, the tournament takes place in June: I wouldn’t be seeing the rugby-soccer-wresting sport live. The ‘field’ appeared (and disappeared) very quickly. Well, that’s what I thought until I started seeing flyer’s pop up in the windows of local businesses anyway. 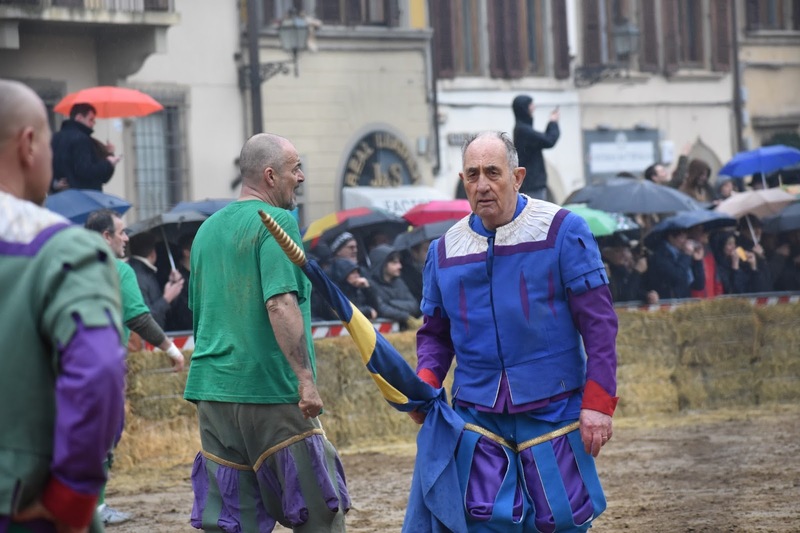 There was going to be a calico storico match! I had been considering a day trip, but knew that I couldn’t leave Florence if I had the chance to see something that was so culturally significant. 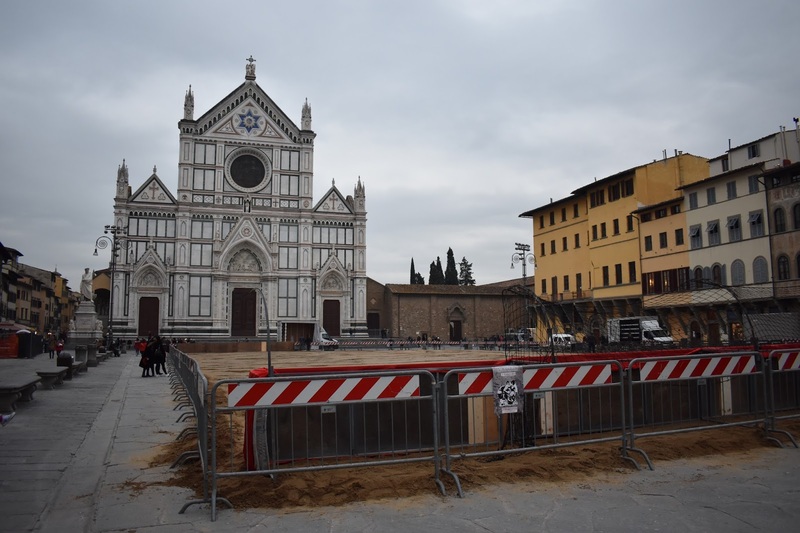 Saturday’s match took place in a sand pit which appeared overnight in Piazza Santa Croce. The game originated in the piazza in the 1400’s and is still played there! 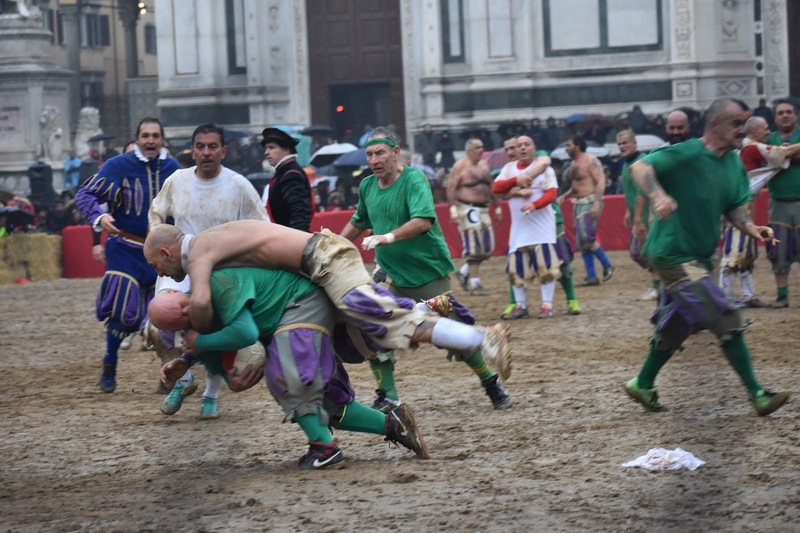 Rumor has in that in 1490 a match of the aggressive sport was played on the frozen Arno river. 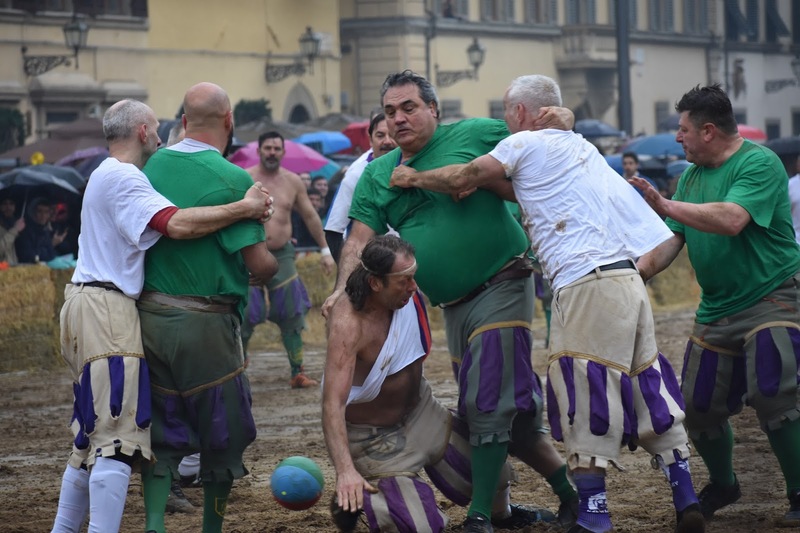 In the modern day tournament, there are four teams (blue, red, white, green) representing the four quarters of Florence: Santa Croce, Santa Maria Novella, Santo Spirito, and San Giovanni. The match I saw was a little bit more of a throwback. Members of the white team, preparing to play. 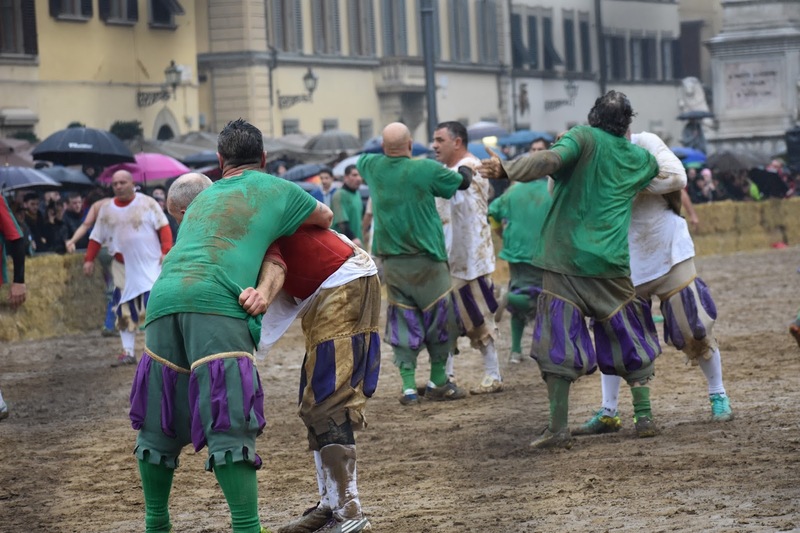 The players were ‘retired’ calcio storico players and the game was green against white, symbolizing a recreation of a historic match played while Florence was under siege in 1530. Fighting with each other, even though the ball isn’t in sight. I’m not a sports person…on my last day of high school gym class, I vowed that I would never play volleyball again for the rest of my life (and I’ve stuck to it so far.) Yet, I found myself in the rain, enraptured by the chaos of this game. The object of the game is to get the ball into the goal; when a goal is made, teams switch sides. A match is 50 minutes long. At some point, there was a lot of colored smoke; I’m assuming that it was an indictor of how much time remained. Granted, I might not have understood all the rules, but I’m pretty sure there aren’t many. Essentially anything is allowed except for punches or kicks directly to the head. According to my Italian teacher, the game is a lot more civilized now than it was in the past; previously, people cleaning up from the game claimed to have found chunks of ear! The fact that it was retired players probably cut down on the violence a little bit too–but one player was taken off the field by paramedics. Oh, and they wear funny Renaissance pants. The pants were probably my favorite part.